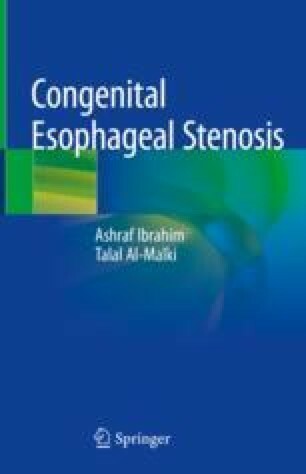 There are few reports about congenital esophageal stenosis in adults. Patients may present with symptoms of non-cardiac esophageal chest pain, meat impaction and dysphagia due to trachea-like multiple submucosal rings as seen by endoscopy in the mid esophagus. CES is an under-recognized cause for long standing dysphagia in adults. CES in adults is more common in men. Radiographic and endoscopic examination show smooth concentric stricture or multiple rings similar to tracheal rings. Endoscopic ultrasonography shows focal circumferential hypoechoic wall thickening with disruption of the normal layer pattern corresponding to the areas of luminal narrowing. A double-contrast esophagogram reveals characteristic findings with multiple ring-like constrictions in the region of the stricture. Patients with mild forms of CES may present later in older children or even in adults with long standing non progressive dysphagia. Careful history taking may reveal recognized symptoms early in childhood. In adults TBR may respond to dilatations. Careful long term follow up of cases with CES is essential for fear of malignancy.